Cherrystone Offer Jubilee / Zemstvo Mixed Frankings! Cherrystone have for auction the Nikitin collection of Zemstvos for sale on November 28th 2012. To my shock, there are two covers with Jubilee frankings! Lots 2017 and 2020 were both sent from England to Russia, and were affixed with a Zemstvo to pay for the local delivery. Lot 2017 was sent from Greenwich, London, and bears two 1 1/2d and two 1881 1d lilac. It was sent to Kupavka Volost in the Bogorodsk district, and sent via Zemstvo Head Post Office where 8k rose Zemstvo was added. Once from the Gevirts collection, it is stated as probably the only known example of double rate from England to Bogorodsk. Estimate: $4’750. Lot 2020 was sent from Cornholme with 1/2d vermilion paying the printed matter rate. 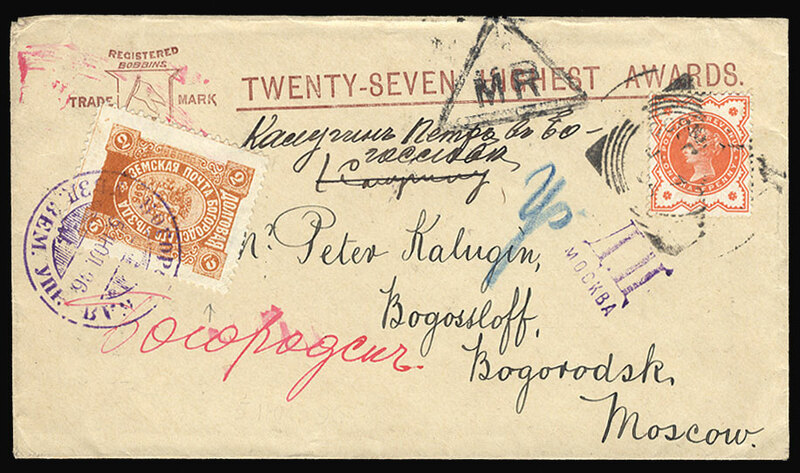 It was sent to Bogoslov volost in Bogorodsk district, via Moscow (1 July) to the Zemstvo Head Post Office (5 July), where 2k yellow brown Zemstvo was added. Once from none other than the Fabergé collection, this cover is apparently the only known example of printed matter rate from England to Bogorodsk, and is illustrated in “Imperial Russia Zemstvo Post”. Estimate: $2’900. Zemstvos are extremely popular at the minute (see the David Feldman sale of Russia on September 19th). However the collectors are much more interested in the stamps than the covers, so the prices in this sale seem on the high side. According to the Cherrystone prices realised, lot 2017 sold for $5’500 and 2020 sold for $3’000.